Birds are a popular choice for a pet. 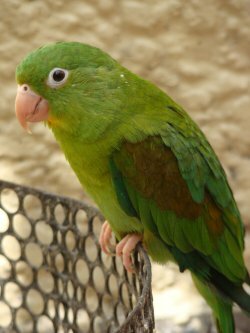 Their colorful feathers and potential for training make them attractive to many pet lovers. This section of tips can help you care for your bird. You'll find some ideas that can help you name your bird, find the right bird for you, and choosing a bird cage. There is also information that will keep your cat away from your bird. The following articles are available for the 'Birds' topic. Click the article''s title (shown in bold) to see the associated article. Birds are very unique and interesting animals. There are many things to consider when keeping your bird happy and at ease. Once you get the basics down, you will love your new pet! A bird cage is going to be a home to your bird, just as much as your home is to you. Instead of forcing Tweety to live in substandard living conditions, use these guidelines to come up with the perfect palace for your bird. Cockatiels and parrots are two of the most popular choices of birds out there. Do to their popularity the choice invariably comes down to cockatiels or parrots. Here is a quick and simple comparison between them. If you have just purchased a new bird, or you are considering purchasing a new bird, then you are going to need to come up with a name. Naming your bird can be a frustrating, exasperating and frustrating experience for many people. Use these guidelines so that you can come up with that perfect and unique name. Just as with any kind of pet, there may be a time when your bird get's loose. Chances are, the bird will only stay within the house, but you will still want to learn how to catch him or her again. Luckily, quickly catching birds isn't all that difficult. All you need to do is use one (or more) of these methods to get the job done. Pet birds may be pretty and beautiful to listen to, but if they peck you that almost surely cancels any kind of charm they may have. So that you may more fully enjoy your pet bird, here's how to stop it from pecking you! Prior to choosing the bird that you want to own, you need to ask yourself one little question. Try to think of yourself as a bird, and ask yourself what kind of bird are you. Here's how you do that. What Type of Finch Makes the Best Pet? A Zebra finch makes the best pet. They are easy to care for and are great pets for beginners. Zebra finches do not require a lot of human interaction and are not very high maintenance.